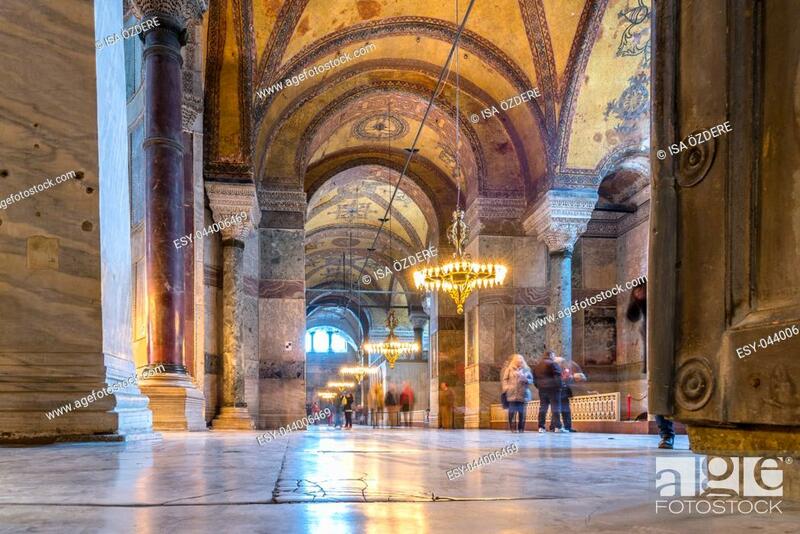 Foto de stock - ISTANBUL,TURKEY- MARCH 11: The Hagia Sophia (The Church of the Holy Wisdom or Ayasofya in Turkish) spectacular Byzantine landmark and world wonder in Istanbul, Turkey, interior view from the upper gallery ... . ISTANBUL,TURKEY- MARCH 11: hagia Sophia interior at Istanbul Turkey - architecture background. ISTANBUL,TURKEY- MARCH 11: Tourists visiting the Hagia Sophia in Istanbul, Turkey. Hagia Sophia is the greatest monument of Byzantine Culture. It was built in the 6th century. . ISTANBUL,TURKEY- MARCH 11: Byzantine mosaic of 13th century in Hagia Sophia in Istanbul, Turkey. ISTANBUL,TURKEY- MARCH 11: Hagia Sophia Museum in Istanbul, Turkey. Basilica is a world wonder in Istanbul since it was built in 537 AD. Virgin Mary holding the Christ Child. ISTANBUL,TURKEY- MARCH 11: Virgin Mary holding the Christ Child. Byzantine mosaic art. . ISTANBUL,TURKEY- MARCH 11: Ceiling detail from main hall of Hagia Sophia, a former Greek Orthodox patriarchal basilica,later an imperial mosque, and now a museum in Istanbul, Turkey. . ISTANBUL,TURKEY- MARCH 11: Interior view of the Hagia Sophia. The ceiling of Hagia Sophia. . ISTANBUL,TURKEY- MARCH 11: Calligraphy roundel with the name of Mohammed, Messenger of God, interior in the gallery of Hagia Sophia in Istanbul, Turkey. ISTANBUL,TURKEY- MARCH 11: Byzantine mosaic in Hagia Sophia in Istanbul. . ISTANBUL,TURKEY- MARCH 11: The decorative interior of the beautiful hagia sofia mosque situated in the turkish city of Istanbul. . ISTANBUL,TURKEY- MARCH 11: Hagia Sophia - ancient basilica in Istanbul, Turkey. For almost 500 years the principal mosque, Hagia Sophia served as a model for many other mosques.